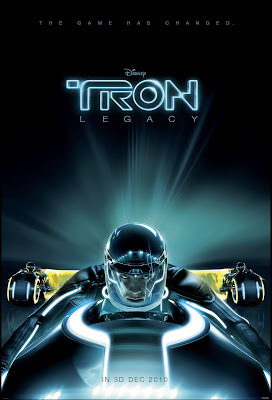 Even though we have to wait a full year for this movie to be released I'm still super-hyped to see both this random pic and the new lightcyle themed poster for Tron Legacy. I'm a big fan of the original Tron movie and the Tron 2.0 PC game was actually pretty awesome. When I saw the SDCC trailer in hi-def for the first time I got popcorn sized goosebumps and I admit that the same thing happened when I saw these too. Sad I know, but how can you not love Tron?